Into the light rain Kev and I tottered off. We managed to run a few sections of the 5-mile stretch to the Tamarack aid station, primarily the downhill ones. Heh heh. We got there just fine, refueled, refilled, and pushed on. The next two stops, Bluff and Dufflin Road were only about 2.5 miles apart each. The weather had held off for a while and we started to dry out a bit by the time we reached Bluff. On our way to Dufflin Road, we took note of the pending darkness of nightfall. Since our pace was slower than expected, Kevin started to get worried about running in the dark. Why? Well, he had packed his headlamp at the Highway 12 station where his next drop bag was, and that was another 4.3 miles beyond Dufflin Road. Fortunately, I had my headlamp with, but running with just one was going to be tricky and slow us down even more. After berating himself for being "an idiot", I reassured him that we'd navigate the singletrack section to Highway 12 okay and not to beat himself up about it. We managed to pick our way through the early darkness with only a few "stumbles" along the way and pull into the Highway 12 station, which was a welcome sight for my frustrated brother's eyes. Now armed with 2 headlamps and refueled, Kev's morale was up. We calculated our current pace and how much time we had to finish the course in less than 24 hours. All we had to do was average 20 minute miles and we were golden. Inspired by this, we set off for the turnaround checkpoint at Rice Lake, 4.4 miles away. 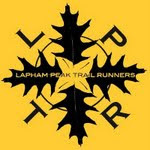 We alternated stretches of running and fast walking through the tricky and rocky singletrack sections. We were making good time and putting minutes into "the bank". But mother nature had other plans. A few hundred yards from the turnaround at Rice Lake she unleashed another storm and downpour. We were crushed. The section we had just traversed soon became flooded and unrunable. Now our rhythm was broken and we were forced to carefully walk the next 4.4 miles back to Highway 12 in the rain over slippery rocks, roots, washouts, and mud. One section became so slick that Kev's feet went out from underneath him and he went down. He stuck out his arm to brace his fall and jammed his wrist harshly. Little did he know then, but the fall had caused a hairline fracture in his arm. Despite the frustration and rain, we pushed on and made it back to Highway 12, not only having lost all of the time we had gained earlier, but losing even more. At this point, Kev said he wasn't going to be able to run anymore. He was totally fried and just wanted to finish this race up. He put on a dry shirt and ate some potatoes in preparation for the final 14.3 miles. I took a few minutes to take off my shoes and wring out my soaked socks before we took off again. After crossing the prairie section en route to Dufflin road we had to navigate some tricky singletrack trails. Halfway through the inky woods we came across a solo runner in distress. He was carrying a flashlight that was obviously on the verge of going out. He asked if we had any AA's he could borrow. Unfortunately for him, all we had was AAA's. Bummer! I let him know the open grasses of the prairie were still 40 minutes away or so if you were walking and wished him well. We stopped at one point shortly thereafter and turned off our headlamps out of curiosity. It was pitch black. You couldn't see your hand in front of your face. We were thankful we had our headlamps and spare batteries. A few minutes later, we came across a pair of runners heading the same direction as the unfortunate man with the fast-fading flashlight. We told them of his dilemma and they sped off to try and catch up to him. I felt better then and was happy to have done a good deed for the day. Our adventure in the section back to Dufflin road was still not over yet. A few minutes later we ran into a couple of Kev's running buddies - Angela and her pacer. Angela was staggering and looked like death warmed over. We chatted for a few minutes and gave a few words of encouragement before continuing on. After the race, we found out that shortly after we had left that spot, Angela lay down in the middle of the trail for a while before continuing on to Highway 12, where she dropped out. Yet another casualty of the day's brutal conditions. Dufflin road checkpoint came and went without any note of significance. We plodded on through Bluff and on to Tamarack, the final aid station. A mile or so before Tamarack, we started to recalculate our time and the possibility of still breaking 24 hours. Kev was going to have to have a miraculous recovery and run 12-minute miles from Tamarack to the finish to have any shot. Nonetheless, we were looking forward to a little morale boost from the fast-approaching daylight. We got to Tamarack at about 5 am. It was light enough now to shed the headlamps. Kev revived himself with some hot chicken broth and off we went to knock out the final 5 miles of this epic adventure. Once again, mother nature decided to poke fun at us by sending us off with another outburst of precipitation. Fortunately it only lasted about 15 minutes, but soon thereafter, the mosquitoes were out in full force. Since the rain had washed off any repellent I had on and we were walking, slow-moving targets, I got miserably assaulted for the next hour. Never before in my life had I been bitten so many times in such a short amount of time. ARGH! With my shoulders, elbows, and knees welt-covered in 'skeeter' bites, we trudged up and down the never-ending cycle of hills in the final 5 miles. Half a mile from the finish, Kev finally decided it was time to turn the legs over one last time and we strode into the finish at Nordic in 24:35:00. WHEW! Relieved, we gave each other a quick hug and I congratulated him on an amazingly gutty effort. I couldn't have been prouder of Kevin for having finished that race despite the weather and tactical mistakes he had made. Most people would have given up earlier, but he kept going on, despite blowing up and knowing that it wasn't going to get any easier. He was a true warrior that day and I'm proud to say he is my brother. Way to go bro!! 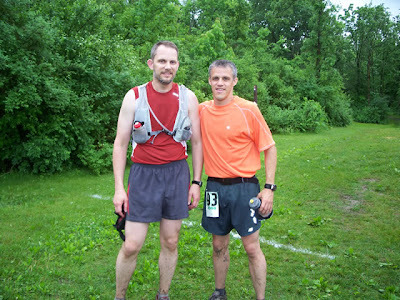 Me and brother Kevin, "The Warrior", after the finish. Yo Bro! Very nice and ACCURATE report! It goes without saying that I couldn't have made it the distance without you! I know next time will have to be easier - It can't possibly rain that much during any race again!! I hope I can return the pacing favor for you some time soon!!!! Go grub bros. Go!!!!!!!!! After his finish at Ice Age, I knew your brother was good, but 24 1/2 hours at the Teapot's amazing. I've read a bunch of reports of the race and it looks like the runners who did best had the best support teams. Great race report Steve. Hope to see you at Afton (I'll just be doing 1 loop). At least I wasn't not the only one with light and balance problems. Sounds like your brother owes you as your pacing definitely helped a lot. (Plus, you're the one doing the blogging.) Tell him way to stick it out, we were the minority. Congrats to both of you!